Performance Appraisals have always been around and so has the methods used to identify the out performers. But the question arises as to whether the methods used provide justice to the outperformers? The need for alternatives to the Bell Curve practice is due to the realisation that such practices are not suitable for high performing teams and underperforming teams. This connection is of value to the customer and it improves the financial performance of the organisation. Calibration is a face-to-face process where ‘easy graders’ and ‘tough graders’ help rate employees more realistically. Create internal performance consultants responsible to define performance standards and analyse performance. Conducting Self-Reviews provides an opportunity to every employee to comment on his /her perceptions and views on achievement of targets. There has been a shift from the collaborative approach (Management by Objective & Behaviourally Anchored Rating Scale) towards the traditional techniques that use graphic rating scale, paired comparison, ranking, checklist etc. Small firms rely heavily on trait-based approaches while larger firms rely on a combination of trait, behavioural and result-based techniques. Other administrative uses include promotions, lay-offs, transfer, termination etc. Common objectives identified are reviewing past performance, rewarding past performance, goal setting for future performance and employee development. 270 Degree Appraisal: The method wherein the employee is evaluated by 3 persons, himself, boss and co-workers. 720 degree Appraisal: The 360 degree appraisal method is practiced twice. First the 360 degree appraisal is done and again but with the boss who gives him feedback and tips on achieving the set targets. Rank & Yank Strategy: It is also known as ‘in or out policy’. The rank and yank strategy is one where employees are first ranked from best to worst and these rankings are used to identify and separate poor performers from the good performers. Financial Perspective:That measures operating income, return on capital employed etc. Customer perspective:That measures customer satisfaction, customer retention, etc. Business process perspective: That measures cost incurred on the employee, quality of output etc. Learning & growth perspective: That measures employee satisfaction, employee retention, skills, etc. We’ve heard a lot of talk about the Recession and some of us may have been in the centre of one in the past or are in one and have to deal with the layoffs. Then you are certainly looking for ways to minimize the layoffs else are looking for solutions. Nevertheless with that being said, here’s something to think about. 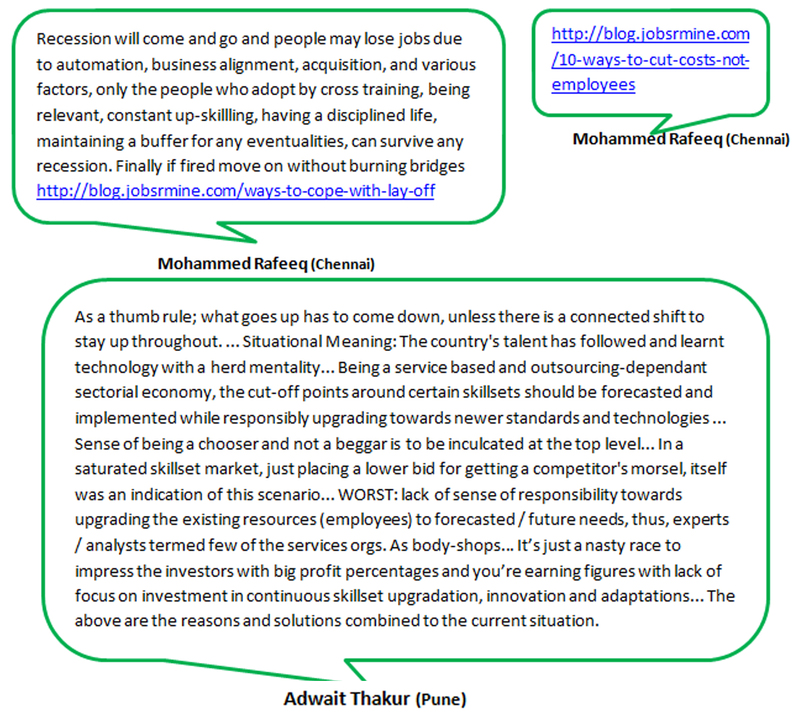 So have you focused on the recession and its effects on Employees and India on a global level? If you haven’t then you’re in time thanks to our Delhi Group member Raveena. She suggested that we have a discussion on, “Views about the recession and its effects on Employees and India on a Global level”. The National Bureau of Economic Research cites a recession as “a significant decline in economic activity spread across the economy, lasting more than a few months” as the hallmark of a recession. The problem with companies nowadays is that they face the recession boldly but bouncing back becomes a challenge. It happens every year and IT companies are most affected as they just hire people without proper forecasting. They keep them on bench but when the companies don’t get projects then they start laying-off which creates a bad impression in the market. AI (Artificial Intelligence) will take over completely hence we have to be prepared and acquire new skills to compete in the market. It’s a wave which we need to get used to minimise the effects it has on employees which is very horrifying creating panic and insecurity. Situational Meaning: The country’s Talent has followed and learnt technology but with a herd mentality. In a saturated skill-set market, just placing a lower bid for getting a competitor’s morsel, itself was an indication of this scenario. WORST: lack of sense of responsibility towards upgrading the existing resources (employees) to forecasted / future needs; thus, experts / analysts termed few of the services of the organisation as body-shops. The no. of Jobless individuals is increasing even though the industry is growing upwards due to automation and technology and we’re experiencing a downfall in Human Resources. It started majorly with Trumps eye on visa program and changes required in it leading to Australia following it as well. There are enormous opportunities in developing countries but for that we need to create a demand for IT applicants and make people tech savvy. People from any stream should not stick to their current skill-sets instead they should develop new skills-sets and focus on profile enhancement. Follow the thumb rulee., “what goes up has to come down” unless there is a connected shift to stay up throughout which is irrelevant. It has vastly impacted Indian employees both directly and indirectly as Indians are present in huge nos. everywhere by choice or chance. The current layoffs and job cuts in the IT sector can affect Individuals, given the pink slips or even profiles that act as support functions related to the industry and across all levels of value chain. Well this brings us to an end of another worthwhile discussion that certainly showcased plenty of key take away pointers to bear in mind especially if we’re trying to cope effectively in a recession. So if you’re looking for answers on how to curb a recession then you’ve got what you’re looking for. We’ve spoken a lot about Employee Engagement, its benefits and the common practices that are followed by various companies. Having been in to the Recruitment Industry long enough you’d have come across HR’s confusing Employee Engagement with Cultural Activities conducted at organisations. To clear the confusion one first needs to understand the difference between Employee Engagement & Employee involvement. There are a number of studies that track the impact of active staff involvement on business profitability and performance which support either scenario. Involvement isn’t just a trendy buzz – word, it’s a principle that has a clear, measurable impact on the bottom line. Cultural activities also known as Zero Hour, etc. and other similar activities conducted are a part of the entire Employee Engagement function but not limited to these activities alone. All interventions, attempts made by the HR to understand and improve the engagement / job satisfaction levels of employee are conducted. The intervention could range from 1:1 by the HR to surveys, people participation in setting up of the organisation processes. Successfully implemented it transfers the ownership of their initiatives from the board room and executive offices to the cubicles and shop floors. Characteristics to look for in Employees to identify the sections they fall into. b) DM us to @SourcingAdda with your name, location and Contact no.